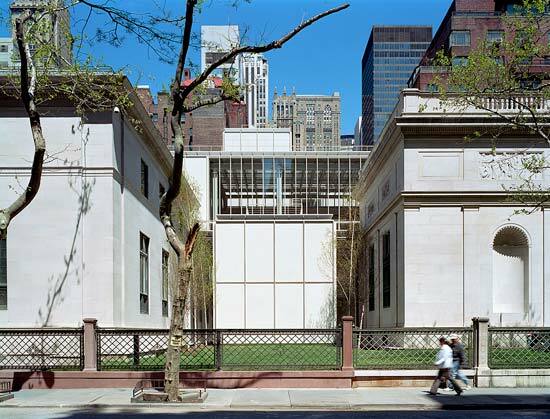 The new design integrates three historical buildings—the original 1906 Morgan Library, designed by Charles McKim; the 1928 Annex building, designed by Benjamin Wistar Morris; and the mid-nineteenth-century Morgan House—with three intimately scaled pavilions to create an accessible and inviting setting. The three new pavilions face 36th Street, 37th Street, and Madison Avenue, with the largest centering the campus and providing the new entrance on Madison. 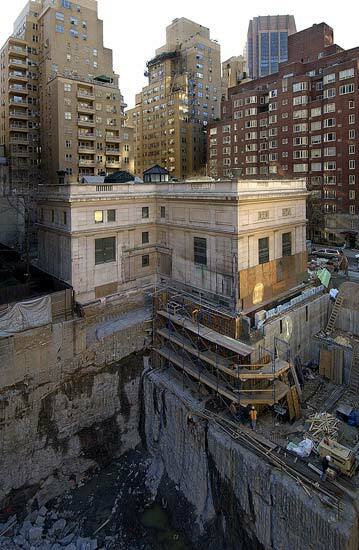 The smallest contains a 20 x 20 x 20 foot "cube" gallery, the Clare Eddy Thaw Gallery, and was inspired by Renaissance chambers Piano encountered in Italy. It is an essential element in the interplay of the three new structures with the three historical buildings. 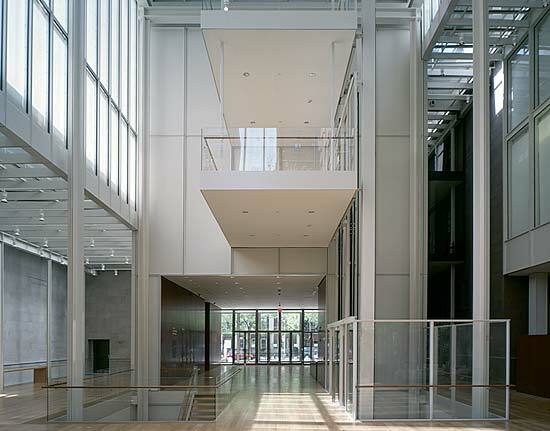 The pavilions are constructed of faceted steel panels and glass, with the steel coated in a rose-hued, off-white paint (a subtle nod to the Tennessee pink marble of the McKim building and Annex). 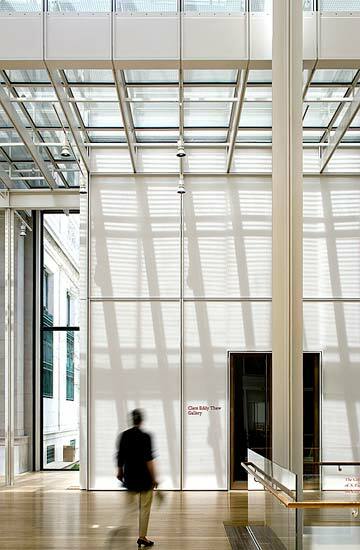 The design also features high-transparency, low-iron glass and baffled roof systems for filtered natural light. The glass-enclosed Gilbert Court connects the buildings and seamlessly joins the old and new, providing many views both in and out of the 151,000-square-foot campus. In total, the Morgan expansion project adds about 75,000 square feet to the complex. Four new galleries—the Engelhard Gallery, Morgan Stanley Gallery East, Morgan Stanley Gallery West, and the Clare Eddy Thaw Gallery—and interpretive installations create many more opportunities for adults, families, and schoolchildren to participate in programs devoted exclusively to the permanent collection. The additional gallery space allows the Morgan to exhibit more of its collections as well as host major loan exhibitions of master drawings, rare books, and original manuscripts. 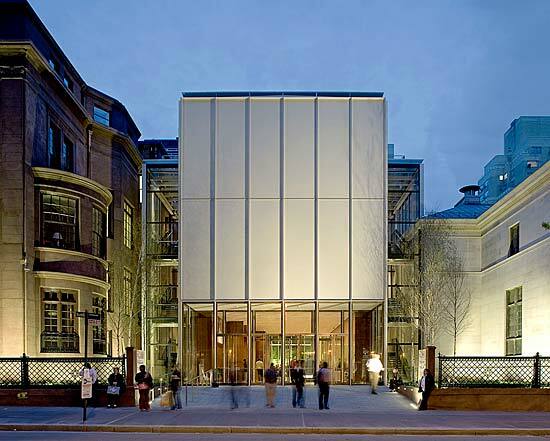 The new galleries are located in both the central pavilion and old reading room space in the Annex, effectively doubling the Morgan's overall exhibition space.